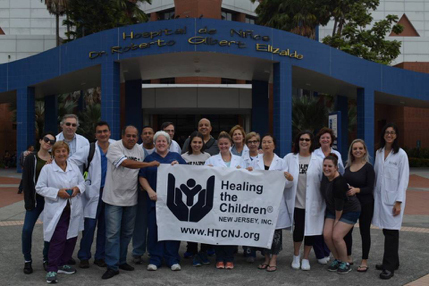 Healing the Children Foundation’s numerous chapters seek volunteers dedicated to helping children around the world obtain necessary medical treatments otherwise unavailable to them in their own environment. Although many healthcare professionals volunteer their time and skills, there is a shortage of qualified medical interpreters that are comfortable in an OR setting. Last summer, I was approach by a Trip Administrator, who was in need of a medical interpreter for an upcoming trip to Guayaquil, Ecuador. Once I shared my interest and qualifications, I was selected as the trip’s interpreter. Although, we had a couple of conference calls, I did not really meet the members until we arrived in country (actually at the hotel). Of the 20 team members, one spoke Spanish (Pediatrician) and two spoke some basic Spanish (Trip Administrator & Surgical Team Coordinator). Which left me to interpret for 16 persons. And then the fun began. Our first day was clinic to review all the potential cases – 60 patients plus family members. I participated in about 40 cases. Many persons speaking at the same time – host hospital staff and our team. Our docs asking the patients (that could speak/respond) or the family members, questions about their condition, history and physical, and current symptoms. Then asking the hospital staff for patient records. Talking about making adjustments, and quick ones! The fire drill allowed me to quickly predict how the conversations where going to present themselves. So many times, I found myself switching back and forth, from consecutive to simultaneous interpreting, to even listening to the medical team’s conversations on case reviews. At the end of the day, I was exhausted, but feeling so accomplished that I was a key instrument for both medical teams and especially the patients and families. Then came the surgeries for the next five days. The cases where scheduled based on severity and complexity. Again, many simultaneous conversations from both medical teams. I was asked to interpret only when someone either had a question or needed to direct themselves to a non-English or Spanish speaker. And this is where we went into a high register. In the OR, the language is very technical because of the procedures and instrumentation. Surgeons and staff have slang names for some instruments. The good thing was that the US medical team performed all the surgeries and were assisted by the host country surgical residents. So most of the conversations stayed independent of each other. However, I would be called to the operating table to interpret for both surgeons, as they were performing the procedures. So here is what’s key, never cross the designated clean area! Although, I was in scrubs, with mask and hat, I could not touch a single thing within the OR. (Which was fine by me.) Picture this, some music playing in the background, side conversations in two languages, and then you get asked to interpret. And to add more excitement, our team had two OR’s running simultaneously. Let’s just say my Fitbit really loved me that week. My day went like this, rounds in the am to review all the previous day cases (patients ward), then to the day’s scheduled surgeries, and then back up to the ward to for rounds. Picture this, both US surgeons and host medical surgeons, along with the US nursing staff and host nursing staff, and of course the US Pediatrician along with the ward Pediatricians (for the most part he was doing his own thing – which really helped out), all carrying on conversations as quickly as possible, in order to review all the cases in a timely manner. Wow, your brain is on fire from switching languages so quickly! Easily ten to twelve hour days, non-stop, for a total of six days. Does it take a special skill? It’s called adaptability. I learned to first understand what the US team really needed in order to perform their mission. Secondly, understand the what the host team needed to support the US team. Thirdly, have a good grasp of the medical terminology for the specialty – in this case Pediatric Urology. And last but not least, understanding the host culture and dynamics. I took it upon myself to have separate conversations in the targeted languages, seeking to understand first and adapting to the language – regionalisms, slangs, and terminology. Most of the US team members were from the Northeast US – NY or NJ. They speak differently from Floridians. The host country medical team, also comes from various regions and walks of life. And then you have the patients and their families. Many traveled up to six hours from their village or town, in order to seek such specialized free medical treatment. Yes, you must follow your training in interpreting, stick to the ethics, but also follow your heart. Numerous times, it was easier to have the conversation in one language, and then express the conversation in the other language. Trying to recall all the information, but most importantly, conveying the meaning of message. It is very gratifying, when both parties sincerely appreciate that you are the conduit and bridge for the language barrier. And my next trip is to Arequipa, Peru, for a Pediatric Ophthalmology medical trip in April 2018.